Hey Jammers! 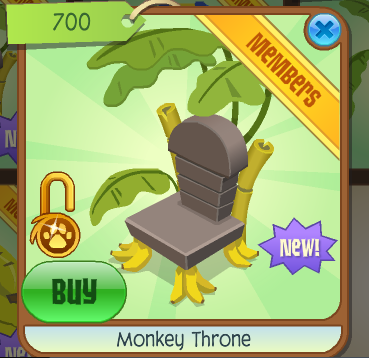 Today's new item is a Monkey Throne! Cool Item! Well I hope you all enjoy the Ancient-looking throne! The cat love story I am writing is called Mewtiful Days. Here's the first chapter of it for your reading pleasure! Lily curled up on her very comfortable cat bed, which was by the stove so it was warm, and purred loudly. Her owner, Mary Anne, who was ten years old, had left to school, so she could finally curl up in her bed. Mary Anne was very nice to Lily, but if a girl could be to nice, Mary Anne was to nice. She played with Lily to much, according to Lily's feet. Mary Anne's older sister, Cassie, was much kinder to Lily's feet. Cassie often reminded Mary Anne that "A cat, even if it is a kitten, which Lily is not anymore, can not play hours on end like you can." Right now, Cassie, who was fifteen, was lifting up her backpack. Before she left the house, Cassie patted Lily on the head, which caused Lily to pur louder. Cassie smiled, and opened the door and soon the house was empty, except for Lily. Lily yawned, and stretched, for now her paws were no longer sore, and stepped out of her cat bed. She silenty walked over to the door, and gingerly pushed the cat flap open. As soon as the cat flap was all the way up, she sped outside like lightning. She started sniffing the air, and detected the scent of another cat. She did not recognise the scent, which meant there was a new cat in town. She followed the scent to the previously vacant house of 124 Yucca Street. There was a unfamiliar car in the driveway, some kind of red buggy. She sniffed it curiously, and the scent was stronger. She continued sniffing, then heard another cat approaching her. She turned around, and saw a rather handsome looking Bengal cat siting beside, head cocked curiously. "Hello," said the Bengal cat shyly. "My name is John Tabby. Just call me John." "Hi, John... My name is Lily," said Lily. His paley baige fur with brown stripes was short, and well-washed, and Lily thought he was the most handsome cat she had ever seen. It was appearently love on first sight for both cats, and John Tabby shyly licked Lily's back. Lily shyly licked John Tabby's back. Soon, both Lily and John Tabby were purring contently and licking each other, but then Lily heard a familiar voice. "Oh, you silly kitty, are you excited to meet your new neighbors?" asked Mary Anne, picking up Lily and holding her in a awkward position, with her hind legs dangling and her shoulders uncomfortably being held by Mary Anne's slightly peanut buttery tinged hands. Lily meowed loudly at Mary Anne, who was sticking her nose into Lily's soft fur and rubbing it around, murmering things about Lily being "the sweetest kitty ever, by far." Lily stuck her paw on Mary Anne's mouth and jumped down. John Tabby tried to hide his looks of amusement with looks of sympathy. Lily shook her fur off and started washing herself. Mary Anne told Lily that it was "time to go home now, sweetie, you can visit your new friend later." "Sorry, John! My owner, Mary Anne, is always like this!" said Lily as Mary Anne carried her home.